Why Is My Cat Pooping Around His Litter Box? Inappropriate elimination could be caused by various issues. Meticulously clean animals, cats generally learn to use a litter box quickly and easily. If you suddenly start finding steamy little presents outside your cat's designated bathroom area, though, it's time to do some sleuthing. 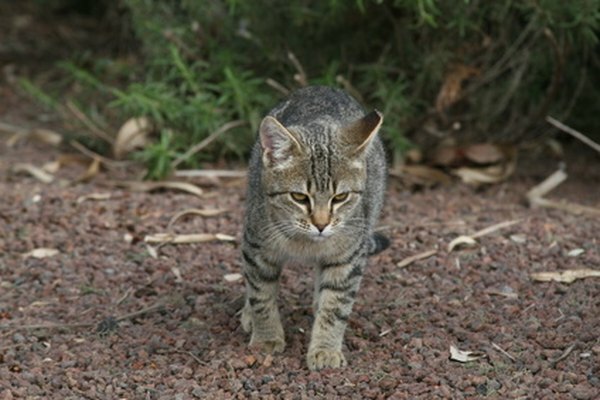 Your cat pooping outside its litter box could be due to a variety of reasons. Pay attention to the frequency of these inappropriate eliminations: An occasional misplaced bowel movement shouldn't be cause for alarm, while more regular appearances may indicate a deeper issue. If your cat has medium or long hair, the appearance of poop outside the box could simply be due to his hair. Your cat may actually be using the box as normal but his hair is hampering the waste from falling neatly into the awaiting litter. As your cat climbs or jumps out of the litter box after doing his duty, the smelly hitchhiker falls off outside. To check this theory, try and catch your cat as he goes in to use his box. See if he climbs inside or remains outside. You should have an answer one way or the other after a few trips. It seems silly to check the litter box if the cat isn't even using it, but some cats are very particular in their likes and dislikes. Changing litter brands or box style may upset the cat, and he will show his unhappiness by not using it. Also, scoop or change the litter more often, as some cats may not use a box they deem too dirty. Another potential cause is location: The box may be in an area the cat feels is too busy or is too stressful for him to do his business properly. Try moving it to a quieter area to give him some privacy. Multiple-cat households need a minimum of one box per cat plus one extra. If you have more than one cat and are finding surprises outside the box, it may be that one or more of your cats is feeling stressed and uncomfortable using the same litter box as his housemates. Consider adding another box or two, possibly in other areas of the house to help encourage a calmer, less crowded atmosphere. Like humans, cats can develop hip problems, arthritis and joint issues as they age. If your cat is older, he may be having problems getting in and out of his litter box to properly do his business. Going outside is simply easier on his aging body. Add a ramp or a lower-sided litter box to help him get where he needs to be. Inappropriate elimination is often a sign of an underlying medical issue, such as constipation or various intestinal problems. If your cat seems to be straining as he tries to go or displaying other symptoms such as changes in his drinking or eating habits, call your veterinarian for a checkup. Medication and diet changes should have your cat feeling like himself again, which should stop the litter box issues. What Does It Mean When a House Cat Pees Where They Shouldn't? Does Feliway Spray Work on Cats That Defecate Outside Their Box?